The service of nearly 180,000 black soldiers in the Union army sped the transformation of the Civil War into a war against slavery. 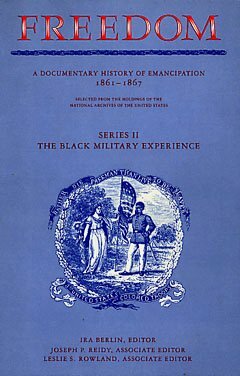 This volume of Freedom: A Documentary History of Emancipation examines the meaning of military service for slave and free-black men, their families and communities, and the nation. It details the recruitment of black Union soldiers in the Northern free states, the border slave states, and the Union-occupied Confederacy, as well as the eleventh-hour attempt by the Confederacy to enlist black soldiers. The documents in The Black Military Experience , many of them written by black soldiers and their loved ones, open a window on the lives of the men both on duty and off. Revealing the triumphs and tragedies of wartime service, they show black soldiers braving the test of combat, enduring the drudgery of fatigue duty, interacting with white officers, protesting inequality within the Union army, facing the dangers of capture by the enemy, confronting the complexities of military justice, liberating and protecting their families, serving in the postwar army of occupation, and returning to civilian life. The Black Military Experience received the J. Franklin Jameson Prize for Distinguished Editorial Achievement of the American Historical Association. Copies of The Black Military Experience may be ordered from Cambridge University Press online, by telephone (800-872-7423), or by fax (914-937-4712). Readers may also be interested in Freedom's Soldiers: The Black Military Experience in the Civil War , an abridgment that includes many of the documents originally published in The Black Military Experience . Initially barred from serving as Union soldiers, black men in parts of the North nevertheless formed militia companies and began drilling on their own. A freeman in Ohio beseeched Secretary of War Simon Cameron for a chance to strike a blow against the rebels. Advocating employment of black men by the Union army on entirely pragmatic grounds, Governor Samuel J. Kirkwood argued that a black man could drive an army team or stop a bullet as well as a white man. General Henry W. Halleck privately advised General Ulysses S. Grant about the changing purposes of the war and the military benefits of emancipation. By late 1862, Union troops in southern Louisiana included “Native Guard” regiments, composed of free black men under officers who were also men of color. General Benjamin F. Butler had permitted the black officers to continue to serve, but his successor, General Nathaniel P. Banks, forced all but a handful to resign. A petition by a group of ousted officers urged Banks to reconsider his position. After Confederate President Jefferson Davis ordered that captured black Union soldiers not be treated as prisoners of war, but instead be turned over to Confederate state authorities for punishment ranging from reenslavement to execution, Union General David Hunter warned Davis that mistreatment of black soldiers or their officers would be met with swift retaliation. 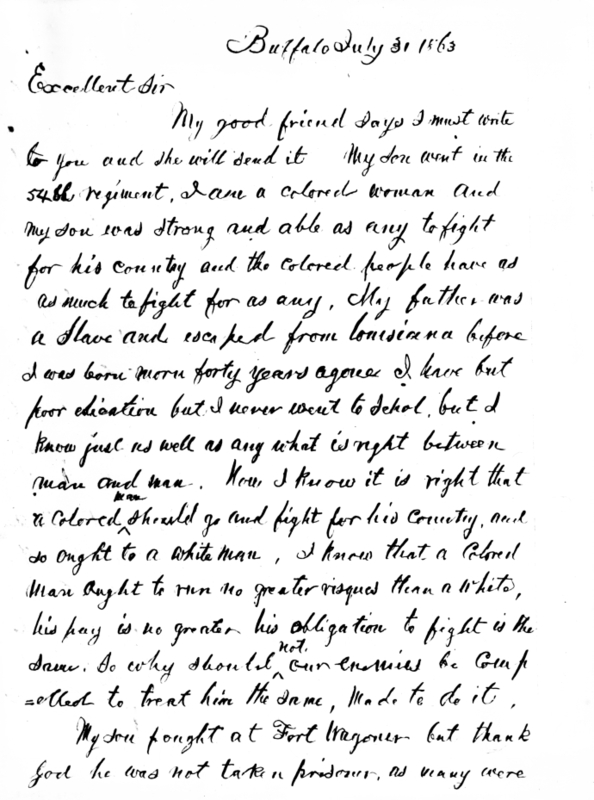 Writing to the chief recruiter of black troops in southern Louisiana, a Union officer reported the bravery of the black soldiers in the battle of Port Hudson, many of whom had until recently been slaves. A Union general described to his superiors the bloody battle of Milliken's Bend, Louisiana, the first test of combat for a brigade of newly enlisted black soldiers. Colonel James C. Beecher, commander of a regiment of former slaves from North Carolina, protested when his men were treated more like uniformed laborers than soldiers. On behalf of the men of the 54th Massachusetts Infantry, Corporal James Henry Gooding protested the injustice of the Union's paying its black soldiers – in this case, Northern free men rather than Southern ex-slaves – less than their white comrades. For many black soldiers, entry into the Union army opened their first opportunity to acquire formal schooling – an opportunity the soldiers seized readily. Theodore Hodgkins of New York warned that failure to retaliate for the massacre at Fort Pillow, Tennessee – in which Confederate troops killed scores of Union soldiers, most of them black, after they had already surrendered – would alienate black Americans from the Union cause. William J. Brown, a freeborn sergeant in a regiment composed mostly of former slaves, conveyed to the secretary of war his comrades' resentment that they were paid not only less than white soldiers, but also less than black civilian military laborers. Unwilling to appoint black men to military positions that entailed authority over white men, until early 1865 the U.S. War Department refused to commission black men as line officers, no matter what their qualifications. Applications for commissions as chaplains and surgeons – positions that did not involve battlefield command – were received with somewhat more favor. Adjutant General Lorenzo Thomas, who was in charge of recruiting black soldiers in the Mississippi Valley, praised the men's military performance and, in so doing, added his voice to those advocating equal pay for black soldiers and their white counterparts. Since July 1863, black soldiers in the 54th and 55th Massachusetts Infantry had refused to accept unequal compensation with white soldiers – a stand that came at considerable cost, including the impoverishment of many of their families. A year after opening their protest, convinced that the government had still not acted to correct the injustice, members of the 55th Massachusetts petitioned President Lincoln for immediate discharge and settlement of accounts. In an unsigned letter, a Northern black soldier stationed in Louisiana described the toll that hard labor and short rations were taking on the men of his regiment. General James S. Brisbin described to his superiors how the “jeers and taunts” that white Union soldiers had directed toward newly enlisted black soldiers were silenced by the latter's bravery under fire. In a petition to a convention of white unionists that was considering reorganization of the state government and the abolition of slavery, black Tennesseans argued that black men were fit to exercise all the privileges of citizenship. In a report to the Bureau of Colored Troops, the white chaplain of a Louisiana black regiment surveyed the changes he had witnessed among his men since their enlistment. Seventeen-year-old Warren Hamelton, a soldier who had been imprisoned for desertion, appealed his conviction on the grounds that the government had failed to fulfill its own obligations to him and he was therefore unable to support his mother. A black sergeant stationed in South Carolina after the war complained to the state's military commander when a post commander failed to render justice to a freedman who had applied to him for assistance. On behalf of comrades from Missouri and Tennessee, a black soldier wrote to the secretary of war concerning the men's concern about their families, their dissatisfaction with routine duties, and their disdain for a particularly obnoxious officer. For former Confederates, nothing more vividly demonstrated the humiliation of their defeat than the presence of black soldiers. Two white policemen in Memphis vented their anger against a black sergeant who refused to be cowed by threats. When former slaves in a Mississippi town sought to establish a school, they enlisted the aid of two noncommissioned officers in a black regiment stationed nearby. 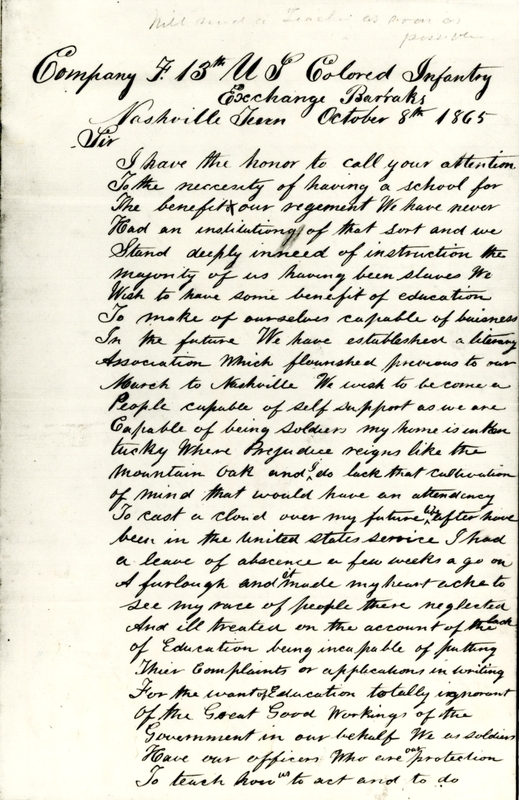 In a letter to an official of the Freedmen's Bureau, Sergeant John Sweeny of Kentucky emphasized the importance of education to his people. A black soldier stationed in Alabama protested that his regimental officers forbade the wives of the enlisted men to visit camp, prompting his regimental commander to defend the need for stringent discipline and cast aspersions on the men's attachment to the women they regarded as their wives. Outraged by Mississippi's newly enacted black code and by outbreaks of violence against freedpeople, Private Calvin Holly wrote the Freedmen's Bureau commissioner to describe conditions and propose a solution. Addressing the officers and men of the 62nd USCI as his association with them was ending, the regiment's commander lauded their role in the struggle against slavery and advised the men about conducting themselves as free citizens. With Union victory won and emancipation secure, the spokesman for soldiers in a South Carolina black regiment asked their departmental commander to allow them to leave the service and return to families who were suffering in their absence. A Freedmen's Bureau agent described the deep hostility of white civilians toward discharged black soldiers, including the shooting and beating of one veteran for the “offense” of expressing pride in his service. Black soldiers stationed at Devall's Bluff, Arkansas, devoted part of their earnings to establishing schools not only for themselves, but also for freed children in the town. More than a year after the war ended, soldiers serving along the Mexican border compared their service to the Union with the shoddy treatment they and their families had endured and challenged their commander-in-chief to make good the nation's promises to them. The wife of a discharged soldier paid a high price for his association with the Union army.